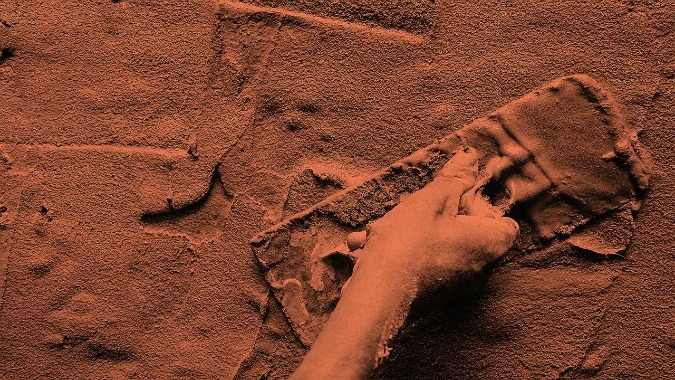 A team of Illinois-based scientists have developed a form of “Martian concrete” that could be used to build architectural structures on the surface of the Mars. 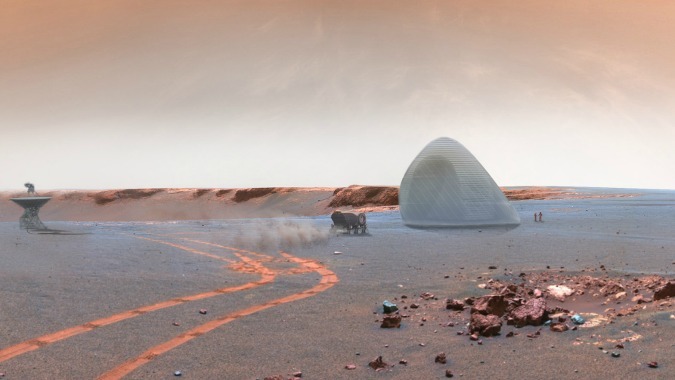 The most important feature of the material is that it construction material that combines Martian soil with molten sulphur and – unlike regular concrete – it is produced without water, which is in scarce supply on Mars. The majority of water that exists on the planet today is frozen. Another advantage of the material is that it it entirely recyclable, so it could be melted down and reset into a new form. 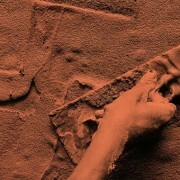 It also has a natural resistance to acid and salt, and can endure very low temperatures. (source). 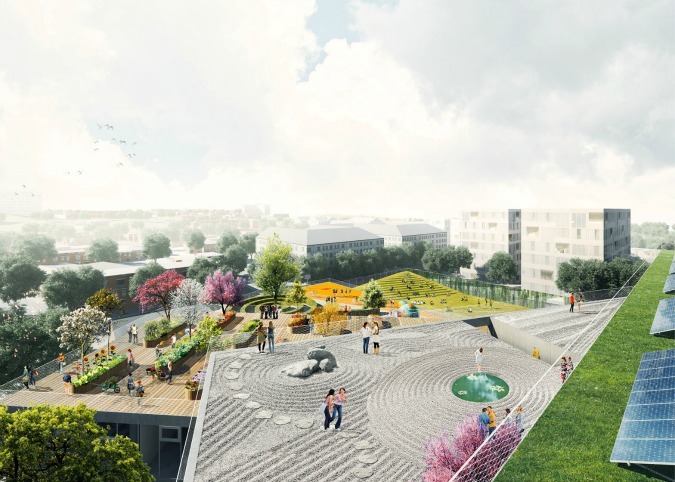 Bjarke Ingels’ firm has unveiled plans to build a school in Arlington,Virginia, featuring a fan-like plan that creates cascading roof terraces. Wilson Secondary School will comprise five storeys. 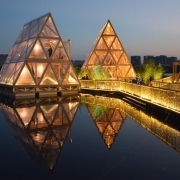 But Copenhagen- and New York-based BIG wants it to feel like a single-storey block, so has arranged the floors so that they fan out from a single point, creating outdoor spaces above each level. This arrayed plan is intended to help break up the massing of the 15,800-square-metre building, which will be located in a low-rise residential neighbourhood on the edge of the Rosslyn central business district. (source). 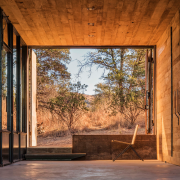 The project is named The Barn House to reflect its open-plan layout, which could later be sub-divided to create a child’s bedroom or a photography studio. 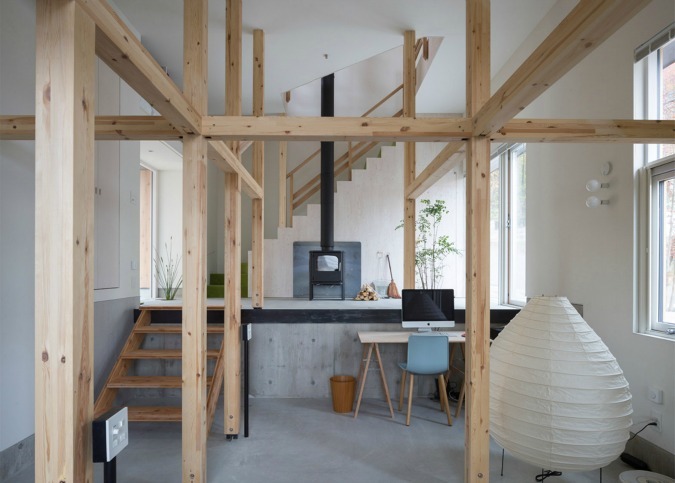 The spaces between the chunky wooden columns and beams, which create the framework for future rooms, match the standard sizes of timber boards, so they can easily divide the open space. 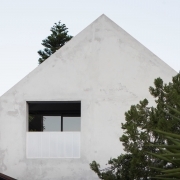 “We aimed to build a house like a barn which can become their own home in the future,” explained the architect. 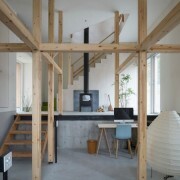 “The client will continue the renovation in their own way according to the changes in their lifestyle. (source). 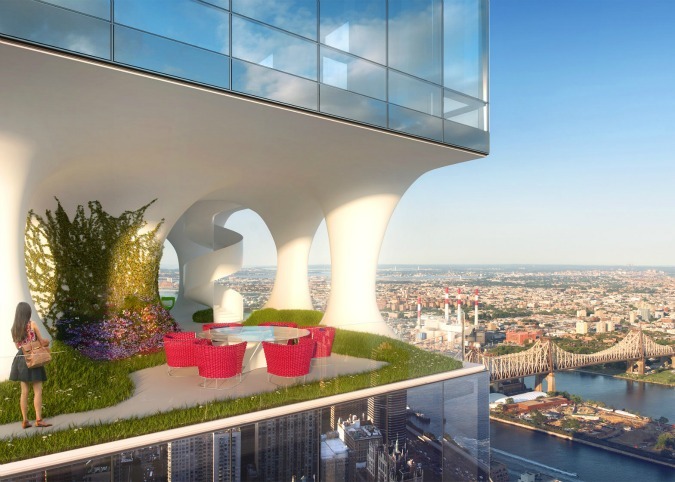 ODA New York’s residential tower for Manhattan features open-air terraces between the floors, designed to fulfill “the dream of a suburban backyard”. 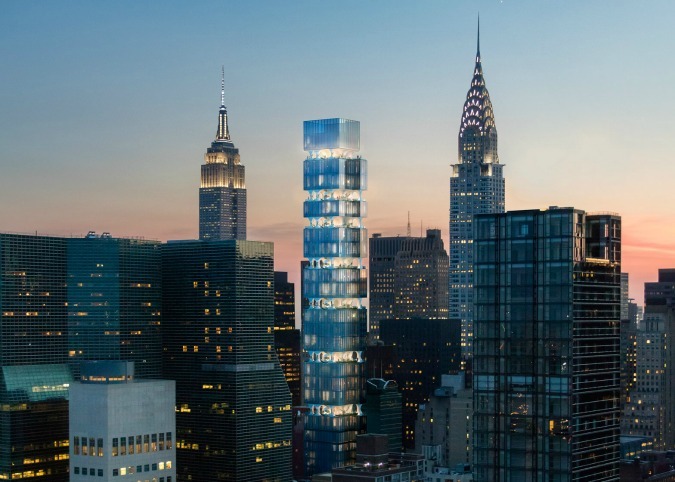 Called East 44th Street, the top half of the building will feature 4.8 metres “gaps” between every two to three floors that will be occupied by open-air terraces. 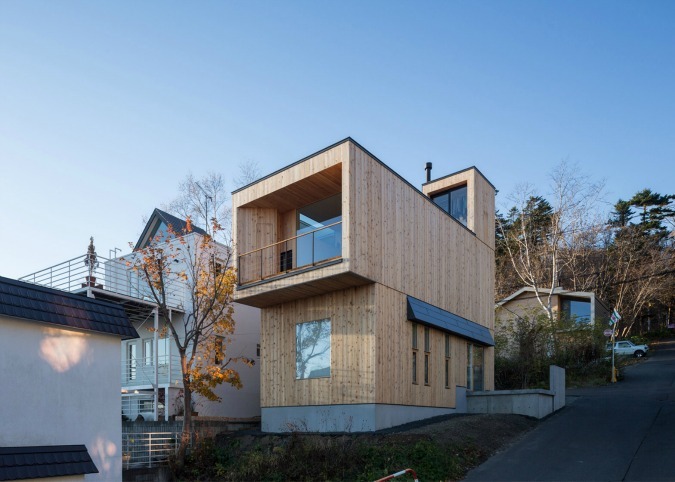 “There is a huge disconnect between how we live in our cities and what we need, as human beings, for quality of life,” said ODA’s founder and executive director Eran Chen. “I don’t think that we should be forced to choose between enduring in the city, or escaping to suburban areas.” (source). 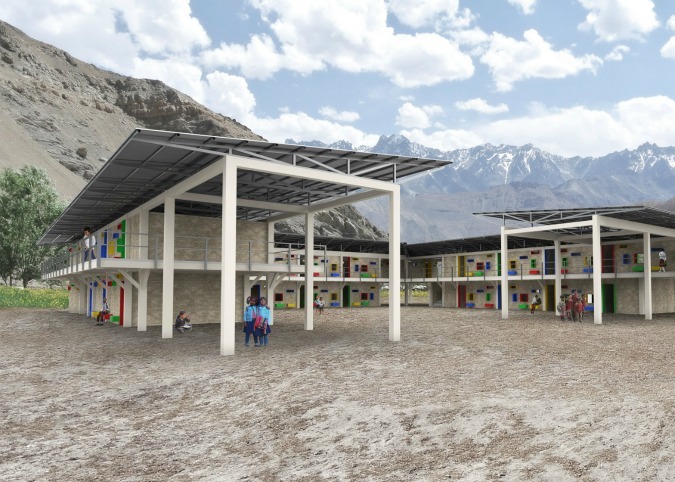 SHoP Architects has partnered with Kids of Kathmandu and Asia Friendship Network to rebuild 50 public schools in areas of Nepal that were devastated by the April 2015 earthquake. 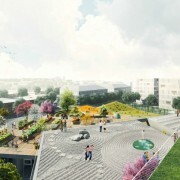 The firm has conceived two flexible prototypes that can be adapted to different site conditions and available resources. “The structures are designed to ensure easy assembly with a limited kit of parts comprised of materials readily available in the affected regions,” said the firm. 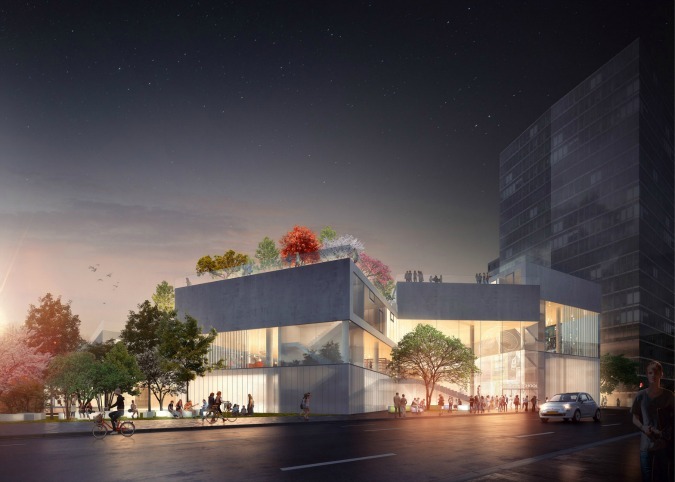 The designs will also be shared online to help other groups and communities build schools without needing to pay for architectural and engineering planning. Both designs feature walls made of locally sourced earth bricks – a strategy that saves on transportation costs. 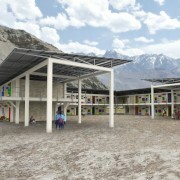 In some cases, the schools will be constructed in remote areas that can only be reached by canoe. 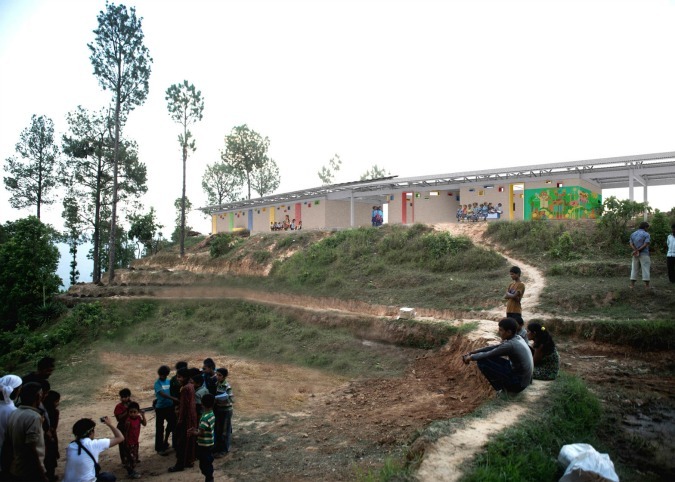 Using locally made bricks also engages the community in the building process, and ensures the buildings are better able to endure an earthquake. (source). 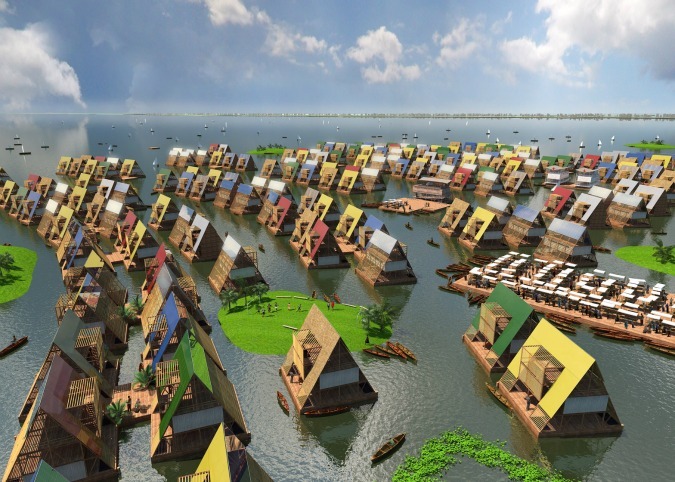 Rising sea levels and a shortage of development sites are leading to a surge of interest in floating buildings, with proposals ranging from mass housing on London’s canals to entire amphibious cities in China. 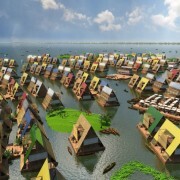 People will increasingly live and work on water, as planning policies shift away from building flood defences towards accepting that seas and rivers cannot be contained forever, say the architects behind these proposals. 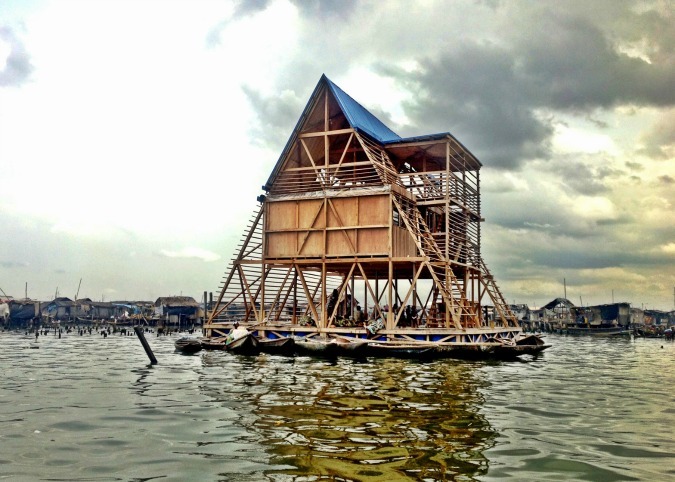 Adeyemi, who is founder of Dutch studio NLÉ, has already designed several aquatic buildings in coastal Africa, including a floating school for a Lagos lagoon. 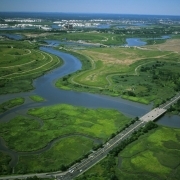 With over a quarter of its land mass lying below sea level, the Netherlands, where Adeyemi is based, leads the world in water management and has developed sophisticated planning policies that encourage water-based living. “Flooding is likely to increase in frequency, severity and intensity,” Baca co-founder Richard Coutts said, “Intuitively we have been taught to hold water out rather than let it in,” he said. “The Dutch have embraced living with water as they have had no choice.” (source).